Let the countdown 'til Christmas continue with DAY 6! There's something to be said for simplicity. It goes a long way - especially in a season with an onslaught of decorations, music & lights. It's very possible you'll be puking Yule logs by the end. 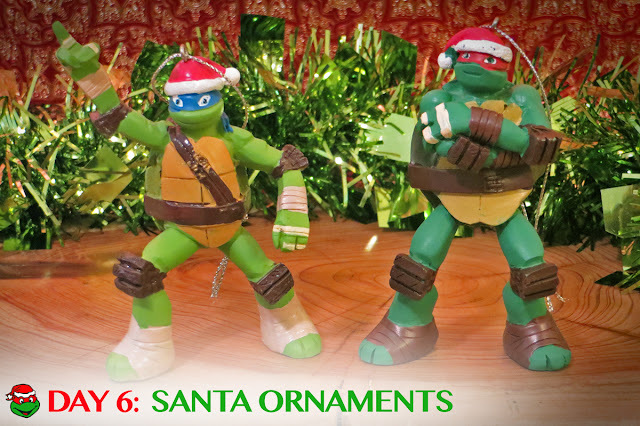 That's why I appreciate the simple stuff, like these very simple TMNT Santa ornaments. The holiday season must be a tempting time for manufacturers. It's so easy to cover your creations in festive colors, Santa suits & every other Christmas cliche available. 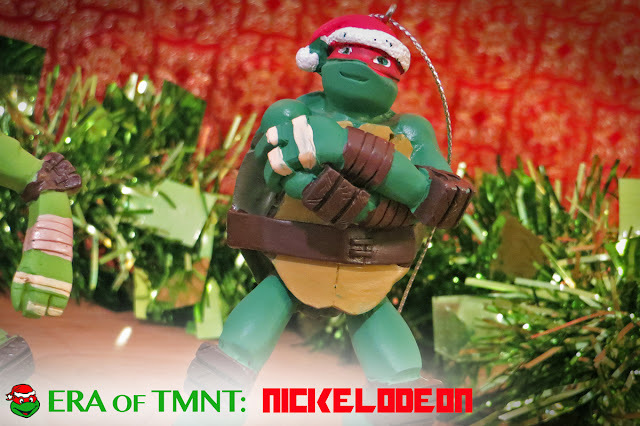 But the creators of these TMNT Santa ornaments suppressed the urge. They kept it simple (there's that word again!) and put a tiny Santa hat on the head of each ornament. The red & blue bandanna - wearing brothers are presented in their 2012 Nickelodeon versions. I love their non-threatening stances. It's like they're embracing the holiday spirit. Their usual overly aggressive, ninja-like stances have been sidelined for something merrier. The 1-2 punch of simplicity & smiles muster up an odd sense of nostalgic, like these ornaments are straight out of the 90s. Something old, something new - a cowabunga concept. Do the Santa Ornaments make a good gift? You'd expect me to give this a glowing endorsement. And I want to, I really do. I LOVE these ornaments. But, notice how there are only 2 of the 4 Turtles? 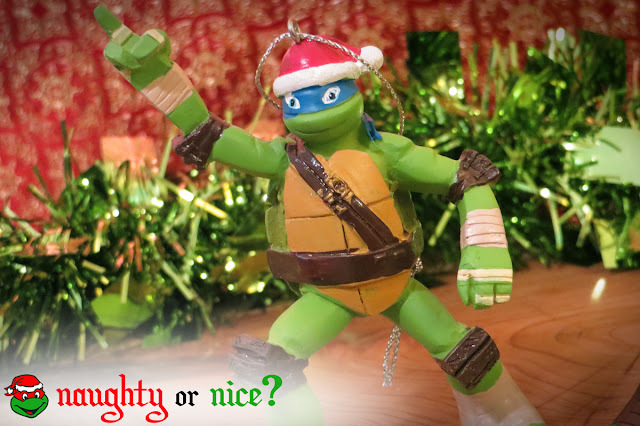 Unfortunately, Michelangelo's version is defective. I saw over 2 dozen ornaments of the party dude and all of them had a defect near his mouth - making him look like he was a drooling. It was a weird, uncomfortable visual that's better left off the Christmas tree. As for Donatello, they don't even make him! Donatello does machines, but apparently not Christmas. That means a complete set of these ornaments will consist of a comatose Mikey & a non-existent Donny. Bah humbug! 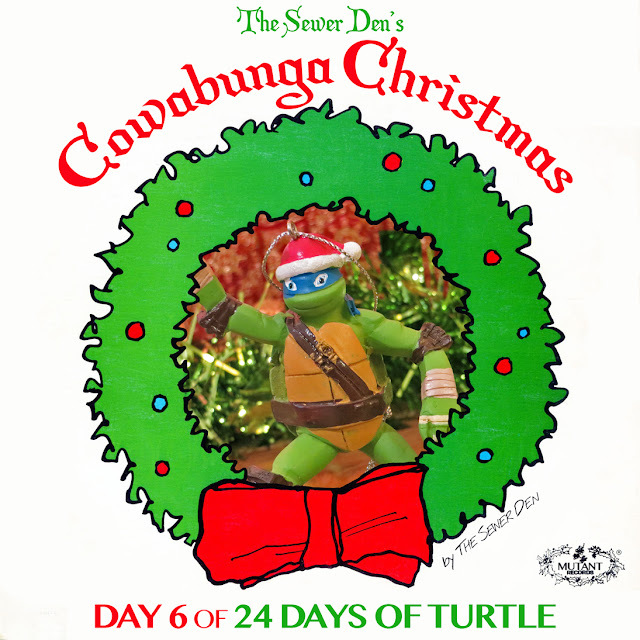 Check back tomorrow for DAY 7 of Cowabunga Christmas! Can't wait until then? Take a trip with the Ghost from Christmas Past to see what The Sewer Den put on display on December 6th in 2013 and 2014. No Donnie!?! I...who makes these decisions? People!! C'mon now!! Someone is lacking the brains to include the brainy Turtle. Lame-o!